That wacky guy, Nick Zachariasen, sent us another nougaty morsel of pop cultural goodness, this one involving race. If you don't already know, these are plastic spoons in the shapes of various animals. Nick recently bought some ZooPals Funtensils to make dinner time fun for his child. 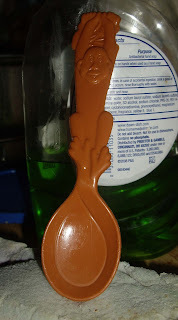 Nick noticed that one of the spoons shaped like a monkey seemed to bear a striking similarity to the kind of 19th-century and early 20th-century caricatures of African Americans. Next to the closeup of the spoon are images of Obama as a sock money and the head shot of a lawn jockey. The resemblance may be unintentional and innocent enough. But as Arsenio Hall used to say, this may be one of those things that make you go Hmmmmmm.